What’s Healthier, Ground Turkey or Beef? The Culinary Medicine students at the University of Central Florida Medical School are working on developing a repertoire of recipes that are both nutritious and delicious. The question about beef vs. ground turkey came up. We are interested in finding out what is better for us, ground turkey or beef? The perception is that ground turkey is better, but does that hold up when the nutrient composition is analyzed? A little research gives us the facts: Ounce for ounce ground turkey, especially the ground turkey typically found in grocery stores, and lean beef have about the same amount of fat. Ground turkey is a little higher amount of cholesterol than beef. Beef is higher in iron and several other micro-nutrients. Many packages of lean ground beef and ground turkey have similar fat content, but the type of fat differs with ground turkey having a little less saturated fat. Individual package labels will vary as both beef and turkey have a wide spectrum of fat content depending upon the company, cut and additives. Overall, ground turkey and beef are very comparable. If comparing sliced turkey breast from a whole bird, the comparison would show a different story because ground turkey typically contains some skin and often dark meat which is higher in iron than turkey breast and also higher in saturated fat. A black bean burger will often have the highest amounts of fiber and the lowest amount of fat, winning the nutrient wars on most individual nutrient comparisons except red meats contain more iron. The choice for the overall winner of a-New Kind of Burger-comes down to personal preferences. Considerations might include differences such as economy, ingredients on hand and preference for vegetarian, red meat or poultry. Adding vegetables to a meat patty is a great way to extend the protein and lower the fat content of the whole burger. The difference the vegetables make in nutritional value is way more beneficial than exchanging one meat for another. Fat content can theoretically be reduced by up to 70 % depending upon how many vegetables are used. I have used carrots, onions, peppers, cabbage, sauerkraut, beets, celery, garlic, potato, eggplant and many other vegetables when making burgers and the different vegetables can offer exotic flavor combinations to burger menus. In the following recipe, oatmeal is used as a binder. We tried bread crumbs in the Culinary Science lab but they turned the mixture a little gummy. Oatmeal is also nice because it is a gluten-free option. Mayonnaise works well as a binder. We tried egg but the mixture included so many vegetables that it was hard to form a patty that would hold together during cooking. A little olive oil or spraying the baking pan or foil with non-stick cooking spray is important. In the Culinary Medicine Lab, the burgers stuck to the foil. The foil did not look like it was sprayed, or if it was, not adequately. It only takes a 1 second spray to keep the burgers from sticking so added fat content is minuscule. If for health reasons a natural oil is preferred, lightly brush olive oil over the baking surface to prevent sticking. 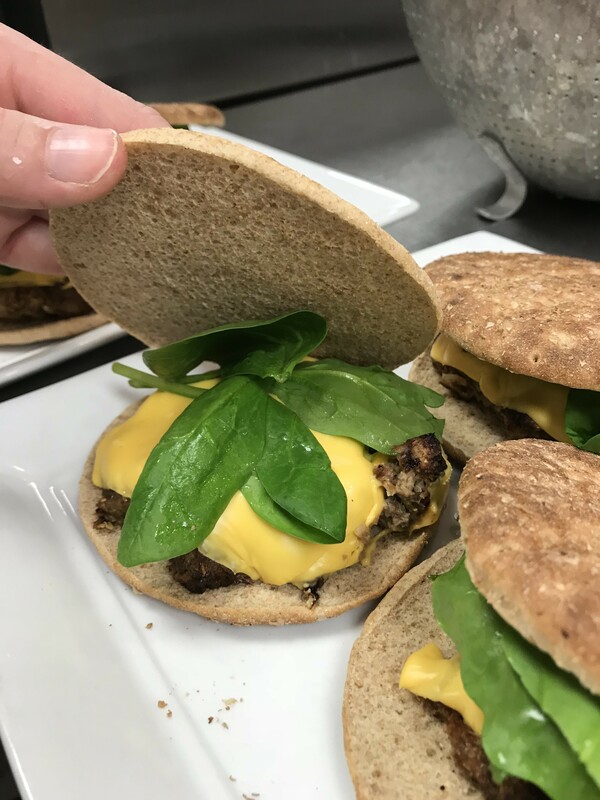 This vegetable and beef burger made in the UCF Culinary Medicine lab was made with lean ground beef, fresh onion and zucchini and topped with cheese and spinach. Below is a recipe for ground beef, chicken, turkey and a flavorful mixture of veggies or use the bean variation for my new favorite black bean burger. Combine all ingredients and form into 5 patties. Place patties on a parchment-lined baking sheet. 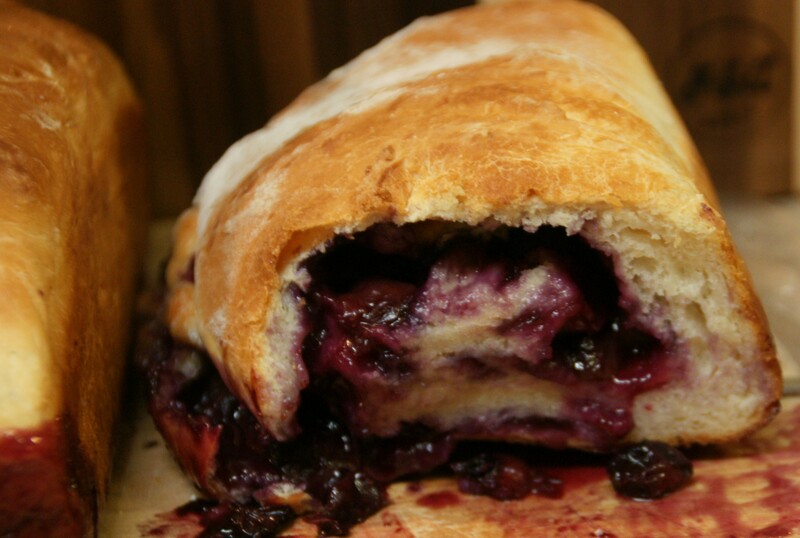 Bake at 375 degrees or until internal temperature reaches desired doneness. (For Beef: 135 degrees for medium-rare, 145 degrees for medium, 155 degrees for medium-well and 165 degrees for well done). Bake black bean burgers just until heated through and vegetables are tender crisp. 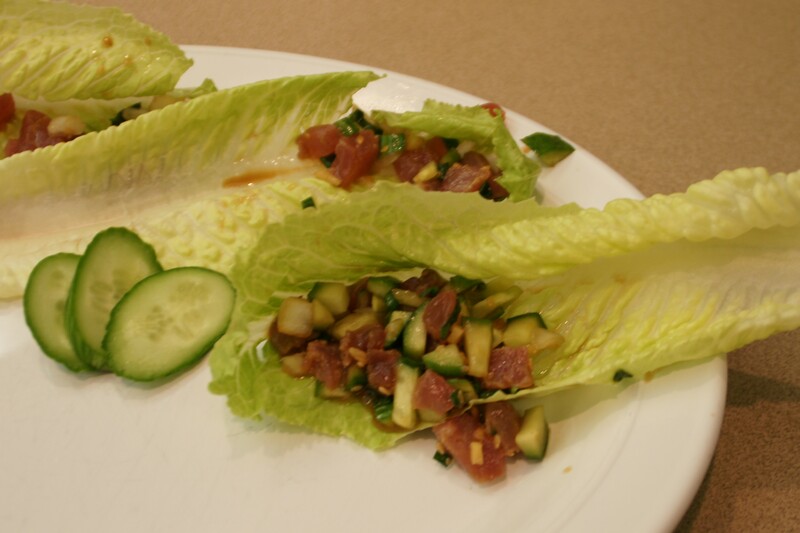 Serve with your favorite cheese, lettuce, tomato and special sauce. Tip: The burgers will hold together better when a food processor is used to finely chop the vegetables. Fold the meat into the vegetable mixture. The food processor turns the meat to mush very quickly and the result is a burger with a gummy texture. The beans on the other hand, do really well in the food processor. Process the beans and vegetables separately to get the best texture. The recipe below is a special sauce created by a team of students by accident. They mistakenly added creole seasoning to a yogurt base instead of the creole mustard called for in the recipe. The result was a great, new sauce that would be perfect on the “New Kind of Burger”. Combine all ingredients in a bowl and chill a few minutes before serving.